Is there anything better than the food match of cheese and beer? Is there anything better than the food match of cheese and beer? We think not. This is the formula Shannon Thorpe looked to when it came to realising his flagship brewery and bar space for his new venture. Fortune Favours is the city's newest beer producer, and they've gone for a thoroughly Wellington vibe. 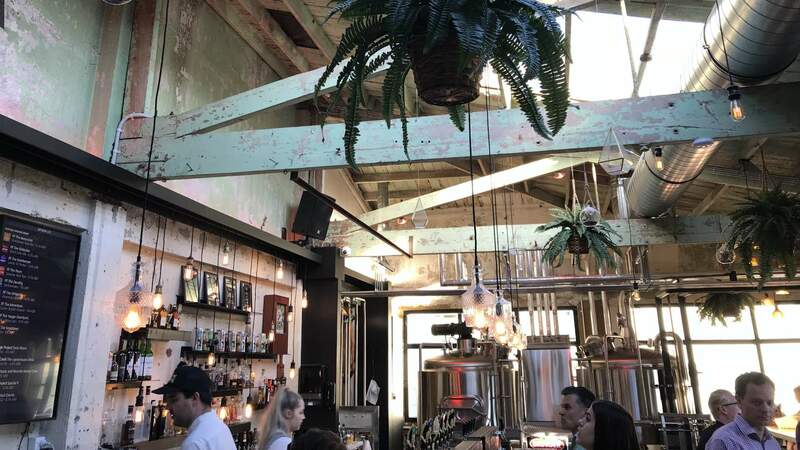 The brewery and bar space is housed in an ex-dipstrippers and furniture restoration business at the edge of the trendy Hannah's Laneway precinct. This area is known for helping to concentrate Wellington's independent producers scene in the last few years, so Fortune Favours is totally at home amongst spots like Fix & Fogg, Six Barrel Soda, The Wellington Chocolate Factory and Shepherd. The heritage building was pretty cool left in its dilapidated state, so Shannon literally stamped the Fortune Favours logo on the crumbling paintwork on the side of the building and gutted it to realise his ideal brewery. As you walk in, flanked by brewery tanks, you'll come into the first of the space's two bars. This bar has the unique privilege of sharing the space with Fortune Favours Meat and Cheese bar (We told you these guys take the food matching seriously). The menu is based exclusively around meat, cheese and beer, so you can take a few options here: with a toasted section of the menu (everything from Serrano ham and gruyere, cheese and beer on toast, roasted brisket and quesadillas priced at around $12-16), a sharing boards section (classic platters of meats and cheeses composed for you, priced between $15-$45), a banging fondue platter option ($25) or a compose-your-own option (build your own with individually-priced meats, cheeses and accompaniments) there is a heap to choose from. One thing we're up for trying next time is the baked Saint-Marcellin cheese with manuka honey, walnuts and crusty bread to smear ($15). The upstairs bar is the epitome of summer drinking in the sun; light-filled with plants aplenty and a view over the laneway, it's the perfect spot to perch with an after-work beer and some mates. Speaking of the beer, we went for a few half-pints to try a lot of different brews. First up, a delicious porter: the Fortune Favours Gatekeeper. Dark with flavours of coffee and chocolate, it would go with a good blue cheese perfectly. Also in our glasses was the pilsner, the Adventurer. Using Green Bullet hops, often overlooked by craft brewers but hijacked by Fortune Favours to give you a fresh spin on a pilsner. For those who may not be into beer but still have their eye on the ace atmosphere and those platters, the Sunchaser Apple Cider is also awesome. Let us introduce you to your new summer watering hole.